Americans were outraged Saturday after John McCain’s funeral turned into a Trump bashing session. 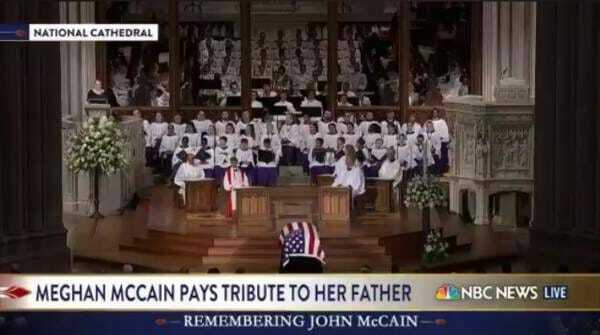 Meghan McCain took the occasion of her father’s death to slam President Trump numerous times Saturday in Washington DC. What a sad and petty woman. It’s no secret to Americans why the third most unpopular US senator is being hailed as a hero. Meghan McCain spoke at her father’s funeral and took several cheap shots at President Donald Trump. Then former President Barack Obama followed Meghan McCain by piling on President Trump. These elitists can’t even shut their mouths about President Trump at a funeral–let that sink in. I AM ONE OF THE OUTRAGED!!! I TRULY SAY, THAT THE McCAIN FAMILY WANTS TO SEE ALL OF US DEAD AS WELL, WHO IN THE HELL COULD EVER LET OBAMA SPEAK ANYWHERE FOR ANY REASON, KNOWING THAT HE SUPPORTS THE MUSLIM BROTHERHOOD AND INVITED THEM OVER TO THE WHITE HOUSE, WHICH THEN WAS THE HORROR HOUSE. WHO IN THEIR RIGHT MINDS WOULD DO SUCH A THING??? I HAVE NO RESPECT FOR THE McCAIN FAMILY WHATSOEVER. I DO NOT FEEL, I KNOW THEIR CONDUCT IS AN ABSOLUTE DISGRACE TO THE ENTIRE COUNTRY AND THEMSELVES. THIS WAS NOT A FUNERAL, THIS WAS A POLITICAL STUNT.